When I felt that sad, nauseous, panicky feeling of STILL being single, I made a big decision one New Year's Day. It happened to be 1/1/11, the day I got dumped by a nice man who was definitely not right for me, but I hoped would commit to me because I was getting "old" and was in SO much fear. Hot! (not.) That actually turned out to be one of the hardest years of my life, but if I had to go back I WOULD do it all again. Because I allowed my pain to move me. I surrendered. I got closer to my Source. I worked hard, on all areas of myself, with a lot of time love and attention. Here's what happened: it spilled over into other areas of my life. I stopped getting distracted by squeaky wheels that had never actually rode their wheels into the thing they were talking about. And the bottom line was, when I sought the guidance of married people, it felt POSSIBLE. I got good at it. I curated and pinpointed my search. I gravitated toward feminine energy women who were married to masculine energy men. The landscape of my acquaintances changed. I permitted lapses in professional boundaries with private yoga students whose homes I entered, and found they were enthusiastic to impart something personal about marriage to me at the end of a session. I sought out members of my personal growth community who seemed happy, and good at self care, and demonstrated trust and self respect by not meddling in their husband's affairs. I listened to them. I heard things like "Yes, I probably would've done it better, but I'm not tellin him that!" and "There's only one captain on a ship" and "He had to take a call during dinner, but I decided not to take it personally." I'd imagine myself in that scenario. I learned who to ignore. Like a woman who told me she regularly snooped in her husband's email and laid down the law that she would be the only driver because "he's such an idiot behind the wheel". Out of this decision came a more acute understanding of myself, and what I needed. I discovered commitment to an even earlier early rise with a siesta was best for me, and I started to carve out my self employment schedule of teaching yoga and writing songs in a different way. By the time I met my husband, I had let go of evening classes on Monday and Thursday nights. Precisely the days he did not have his kids. (Not an accident. A law of the Universe at work.) My afternoon siesta opening turned into an opportunity to pick up his kids after school once we had made a commitment to dating long term. I still maintain steady exposure to people who are committed to kindness and respect towards their spouse, and avoid those who are not. Even a recent interview with Sarah Jessica Parker on the Goop podcast proved to be something that will remain with me. When asked about her lasting marriage, she said something like, 'it's so satisfying to be irritated, but I'm sure he gets irritated with me, too.' She talked about seeing her future with her husband and wondered if a small thing is really important in the face of that? This is the kind of thing I am talking about. Big picture is great, but if you want how, you gotta hear from people in it. So in the spirit of offering to you what I myself needed, I'm sharing from my present-day treasured, spiritual, messy married life with my husband Oliver. I love him more than when I met him. Hope I can help you trust that he or she is out there, and fulfillment is possible. Because it is. This week I go deeper into some of the correspondence I had with my first single, masculine man listener who emailed me. I answer some of his questions and concerns, and also expand on how we both think men get a raw deal at times. I want the feminine female listeners to hear from the inner world of a single guy and know they go through their own challenges on this journey too. Casella and Grease on the "3 Cs"
Matt Casella (on left) and Brendan "Grease" Greeley are old friends from Chicago. They happen to be two of my brother's closest friends-I've known them since they were little kids, and now they are old enough for me to pretend we are all the same age! (Hahaaa) They are back on the podcast again after being one of my very first interviews, and this time we caught up with eligible bachelor Grease about his latest dating adventures and discussed what Pat Allen calls "the three Cs"...communication, chemistry, and compatibility. Bachelor #1, what's your ideal first date? It's time for you single ladies to hear from a real live handsome good hearted man who wants love marriage and kids, so you can realize they are in your hood too!! Keep the faith!! My guest this week is my single and available friend Matt Ciccone. Email me if you want to get in touch with him! I once read that Jerry Seinfeld said he married his wife Jessica because she was “good air”. I loved that- something about her was just breezy, high, good weather. And to me, that was what I was doing when I was sharing my philosophies during yoga classes I taught for many years. I wanted to help everybody get to their good air. My student Michael once came to my Friday 7am telling me that in the middle of the night he had remembered a guy he saw sleeping on Pico Blvd. So in the morning, he made a breakfast sandwich thinking, ‘if he’s there, I’ll give it to him.’ He was. He came to that class so, so happy. That’s good air. We all have stuff and avoiding it is impossible. I am the first to fall down a well of my own self pity and forget others, and forget perspective-but we can still attempt a daily shift. So this week on the podcast, 25 sentiments I’ve carried, learned and discovered that can cultivate "good air" in you- and let’s just say I attend my own lectures. How do men today really feel inside? The best part about having a podcast is that when I meet a remarkable and interesting person, I get to invite them to have a conversation with us. That's what happened when I recently met a woman named Nancy and we explored this question about men, among other ideas. 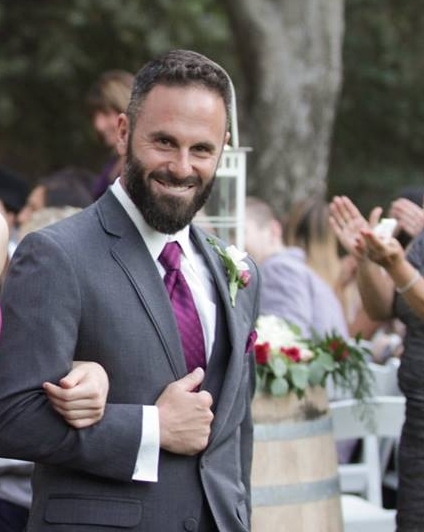 Evan Marc Katz has been helping women find love for 15 years. Evan Marc Katz is a dating coach who specializes in helping smart, strong, successful women understand and connect with men. He's also been married for ten years and has two kids, and recently wrote a blog post called "Why Married Women Get a Raw Deal". I found this piece insightful, rational, and it seemed like a compassionate conversation starter among spouses who want to negotiate enjoying their life. When he told me he got a lot of negative feedback, the conversation took an interesting turn into our current climate, heated by case upon case of abuse and harassment caused by prominent men. Enjoy our chat from the grey area of what seems to be a black and white standoff. To learn more about Evan go to his website.